If you’re looking for the latest in wedding dress trends, then be sure to check out the December issue of Ireland’s Wedding Journal. They’ve filled their magazine with loads of beautiful wedding inspiration and trends, and are sure to have just the dress you’re looking for, including some of our favourite styles! On page 62, they’ve featured one of 2015’s top trends: Plunging Necklines. It’s here that you’ll find our Style 2016. This all-lace wedding dress is a fit and flare design, finished with a beaded belt at the waist to draw your attention to the daring neckline. If you’re looking for an eye-catching wedding dress for your special day, this one is sure to please! Also on page 81, you’ll find some another popular trend: Lush Layers, featuring our Style 2011. This beaded and organza wedding dress is finished with a lace, sweetheart bodice, and paired with a tiered organza layers will float across the floor as you share your first dance. To see read a digital copy of Ireland’s Wedding Journal, click here. 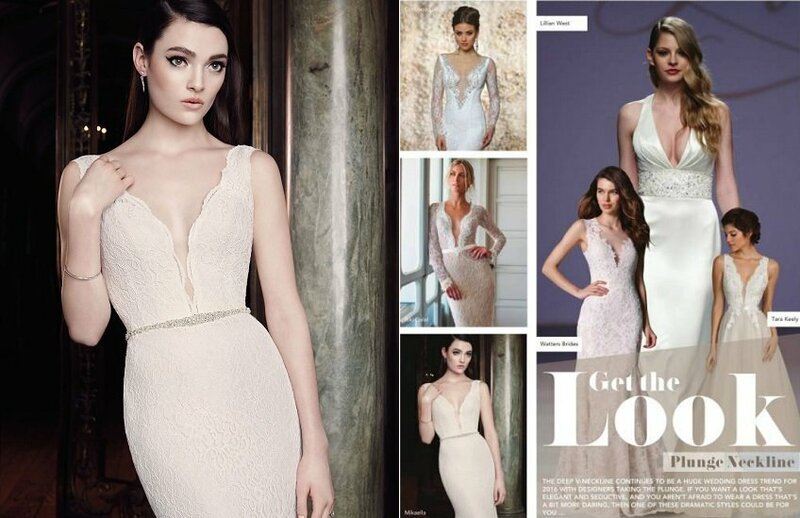 Want to see where else our gowns have been featured? Check out our “As Featured” board on Pinterest!